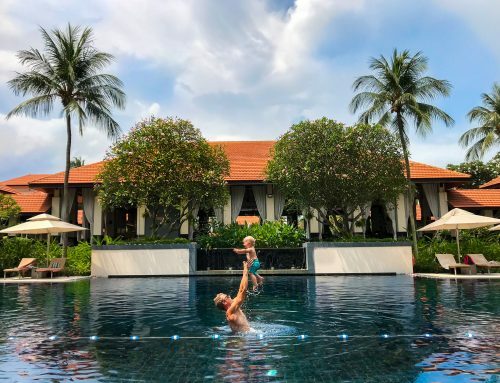 Community post by Jane ~ I had been to Singapore twice before having Bruno and neither time did I feel it was particularly a family destination. I wasn’t necessarily looking out for the wealth of kid friendly activities and play parks. We visited in December when Bruno was approaching his second birthday and had the best time. 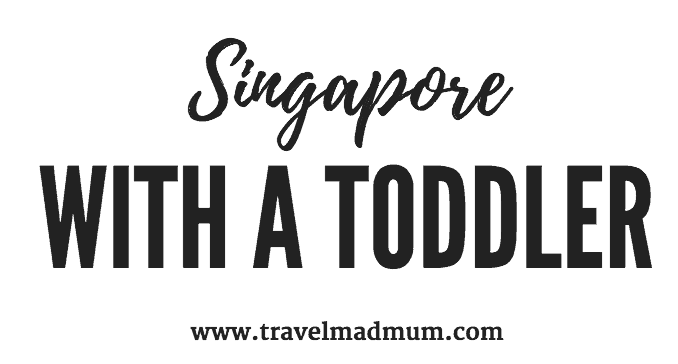 Whether it be the amazing water parks, endless malls with play zones or free fountains to cool down, we all found it easy to be in Singapore with a toddler. We spent a week there in two separate visits on our way to and from Koh Samui. Find flights with Singapore Airlines here! 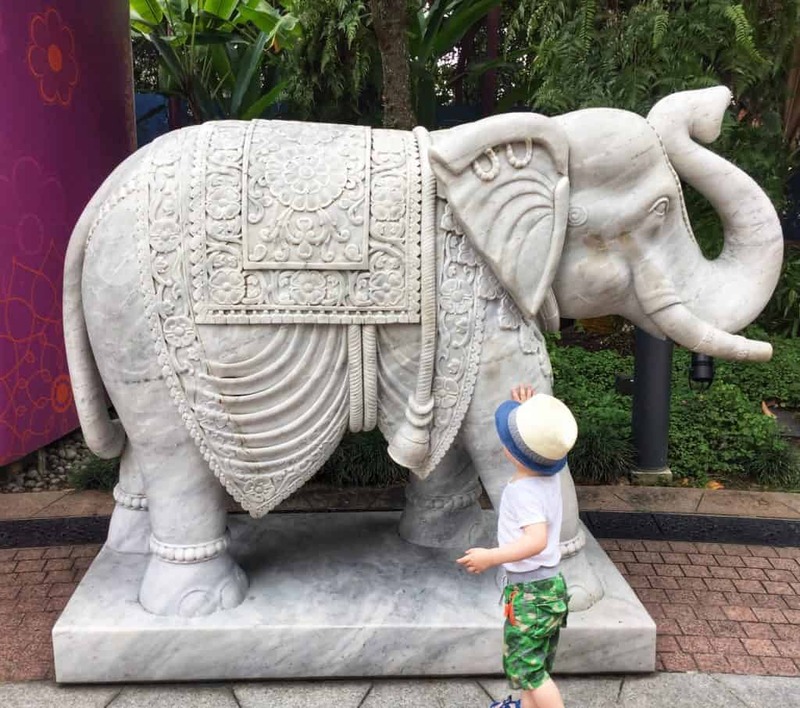 There are endless opportunities to entertain a little one in Singapore so I have chosen my highlights. Singapore has a multitude of shopping malls, most of which have a child play area and all are air conditioned. One of my worries about taking a toddler to the tropics was the heat and humidity. 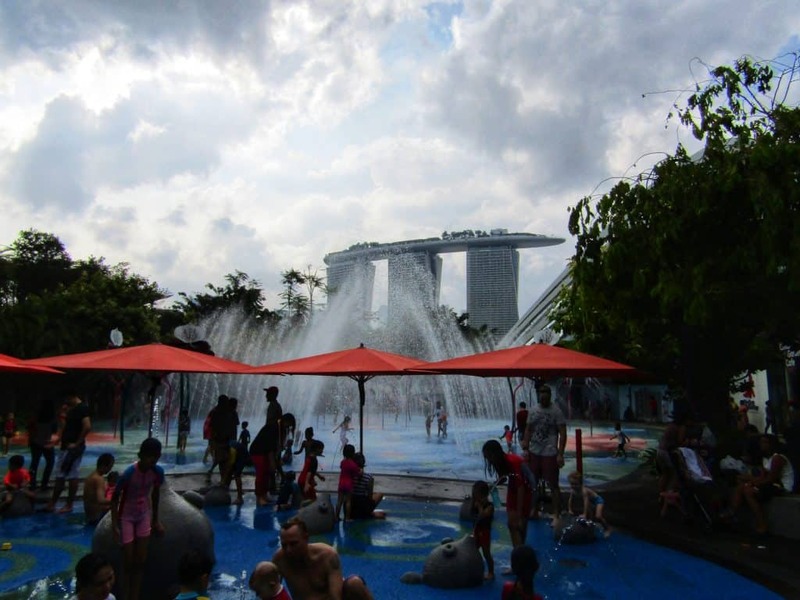 I needn’t have worried, there are fountains and AC play areas dotted all over Singapore. We spent the day at Wild Wild Wet and had such an amazing time. If you and your kids like waterparks, you should certainly check this place out. It’s close to the airport and we went on the day we were flying home. Our flight was at 11pm so we had to check out by midday and then the whole afternoon and evening to spend here. We had the use of an onsite cabana which I would highly recommend you book in advance. A cabana is essentially a large tented area right in the middle of the action. You can see some in the background in the picture of the sign above. Each cabana comes with a huge locker, sofa and lounger and you can zip the sides shut for some privacy if needed. We had the VIP package which also came with towels, WIFI, snacks, drinks and a huge float. I loved that we could nip back to our cabana to have a drink and Bruno had his afternoon nap on the sofa. 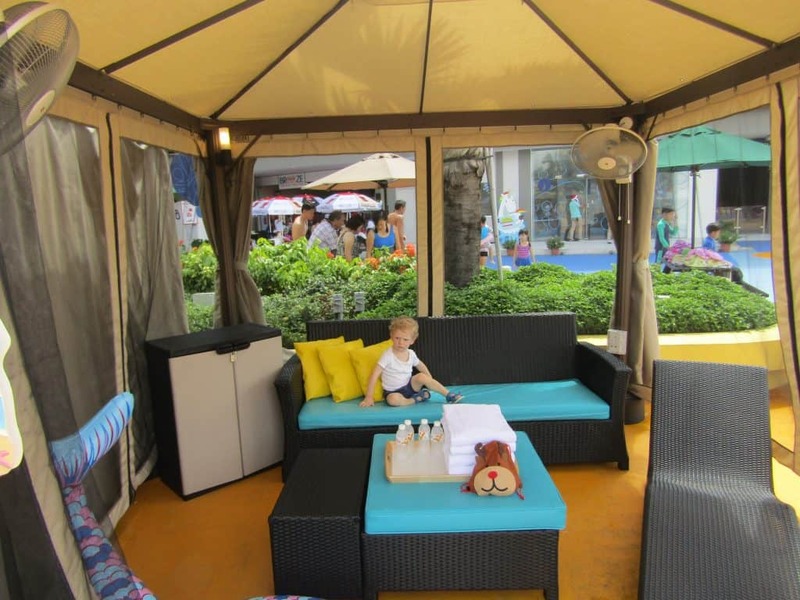 They have 2 fans in the cabana which means its a great place to chill out and have a break from all the fun! The water park its self was great fun. There was plenty to do to for our 2 year old, although he was too small to go on the larger and faster slides. I think he would have got even more out of the experience had he been a bit older. The bubbles play area and lazy river were his favourite hangouts although he must have gone down the smaller slides at least 100 times! 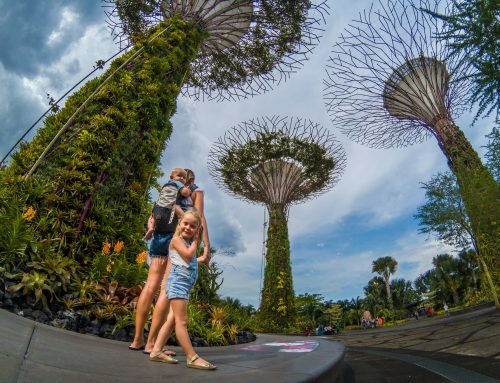 Known for the iconic ‘Super trees’, Gardens by the Bay is a fantastic place to take kids of any age. There is so much to see and do that you could easily spend the day here. We made a bee line to the Supertrees but got very easily distracted by all the amazing sculptures along the walkways. Bruno spent about 15 minutes hanging out with this elephant in the photo. Such a beautiful statue, one I might have overlooked had I not been with a toddler. The free Kids Garden is certainly worth checking out, just remember to take your swimming gear. We all happily piled into fountains to cool off and spent a further hour playing here. It is a mecca for all kids in the area which is perfect if travelling with a solo child as they can quickly find play mates. There is a toddler water play area, a huge fountain play zone for bigger kids and treehouse’s to explore. 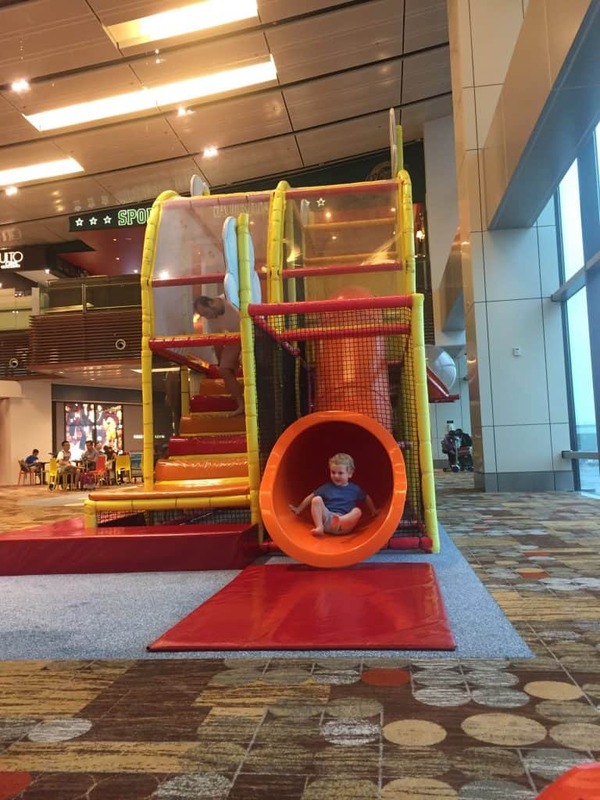 I couldn’t talk about play in Singapore without mentioning how amazingly kid friendly the airport is. There are loads of kids play areas, free strollers, excellent food options as well as a butterfly garden. We passed through the airport twice, once on the way to Thailand and the other back home. Both times, Bruno had the best time on this huge soft play area. Singapore is a foodies heaven. 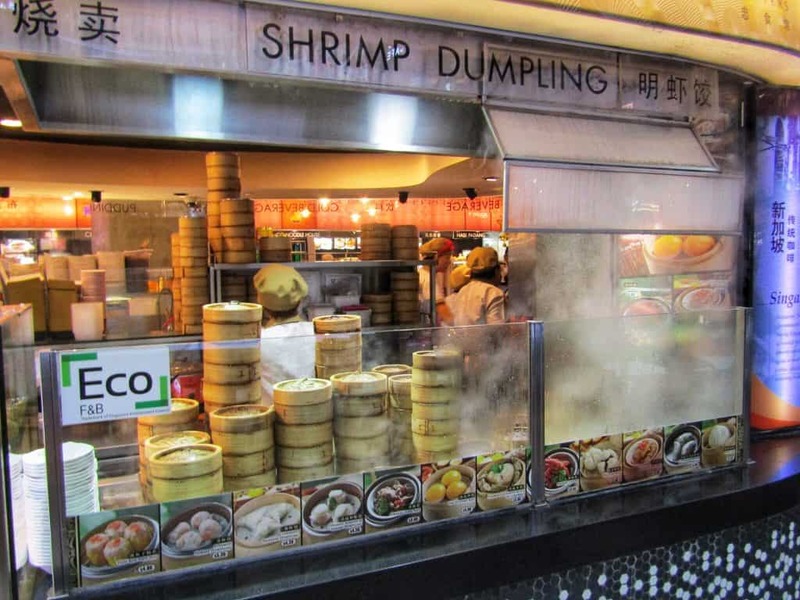 There are endless options to sample, ranging in price from super cheap street food to astronomically expensive fine dining. Bruno was never a fussy eater, however, about a month or so before we departed, all changed. He turned from the ‘try anything’ baby to a super headstrong and independent picky monster. Below are two of the places Bruno ate well. Most of the malls had excellent food courts which had a plethora of options. We ate in the food courts most days due to their excellent quality and inexpensive nature. Bruno is a big fruit fan and each food court had a fruit and smoothy stand. The food courts worked well with a toddler as they were really informal and Bruno could happily explore without anyone batting an eyelid. I was a particular fan of the fresh dumplings at the Rasapura Mall. 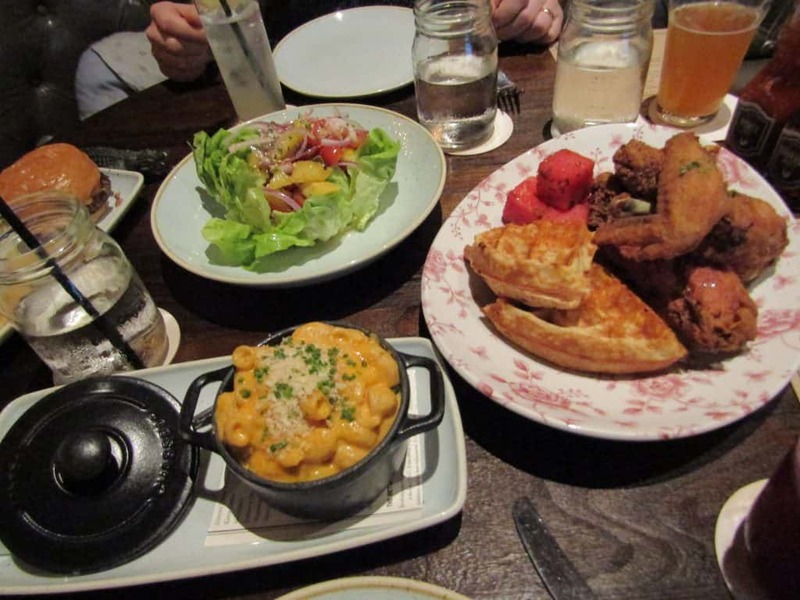 We had a fantastic meal at The Bird Southern Table & Bar located in the Marina Bay shopping mall. After a few days of unusual food, my fussy toddler was keen to have some western food. We had the most delicious meal at The Bird, they made my son really welcome and had a great kids menu. I particularly enjoyed the grilled mango salad and Bruno was thrilled to receive his Little Burger. 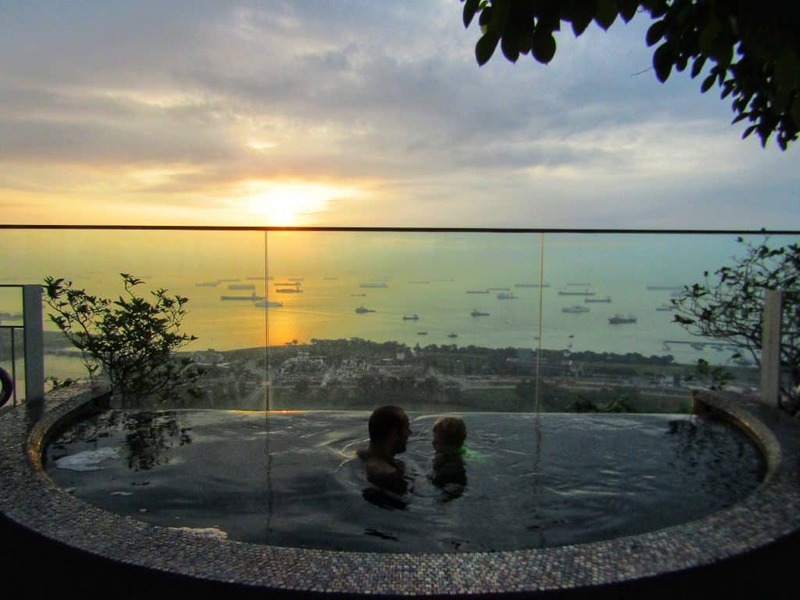 When looking at hotel options in Singapore, we decided that we should splash out and stay at the amazing Marina Bay Sands. The building is one of a kind and so amazing. It is really expensive but we were pleased we stayed there. The room was plush and comfortable and the views were unbelievable. 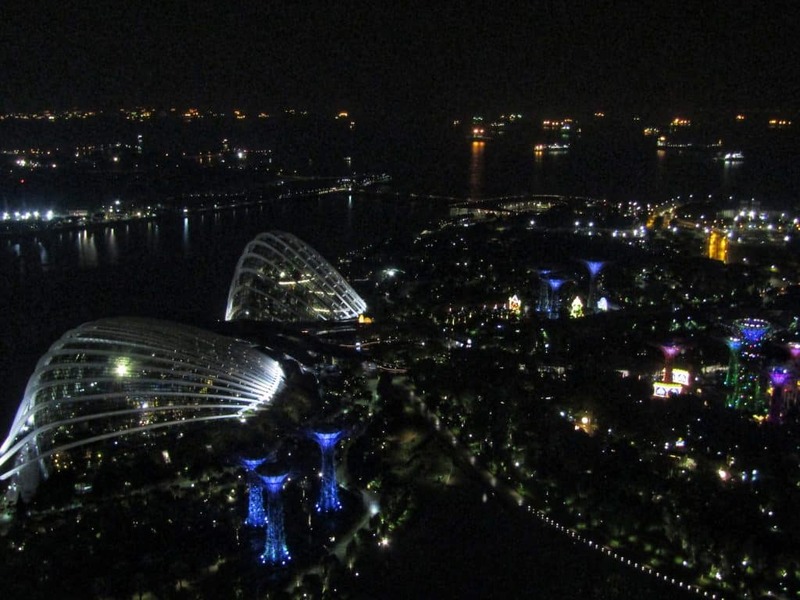 We had harbour views so we were overlooking the Gardens by the Bay. This meant that we had a birds eye view of the light show each night which was amazing. 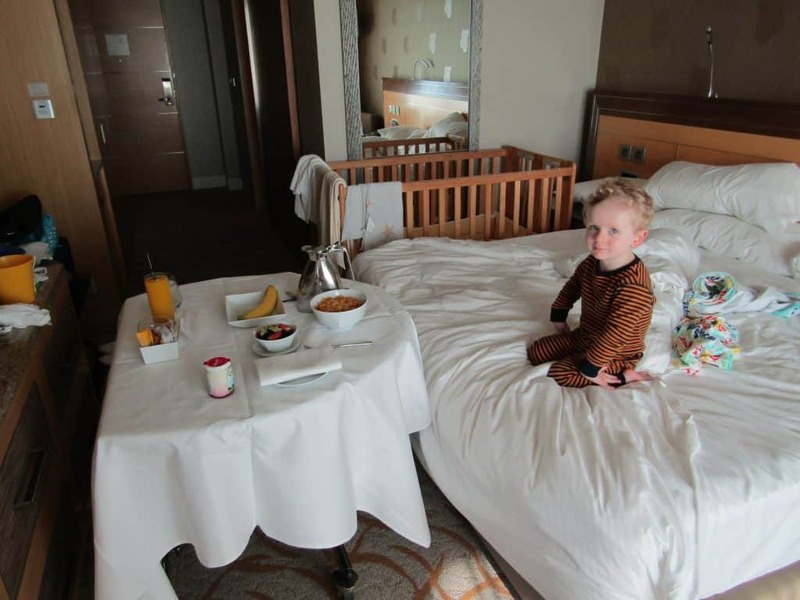 Jet lag got the better of us one morning so we ordered some room service for breakfast. Bruno was so excited as they wheeled in our food, it was a real novelty for us to eat breakfast in bed. It was great to have cereal, yoghurt and fruit for Bruno, the same breakfast he would have had at home. 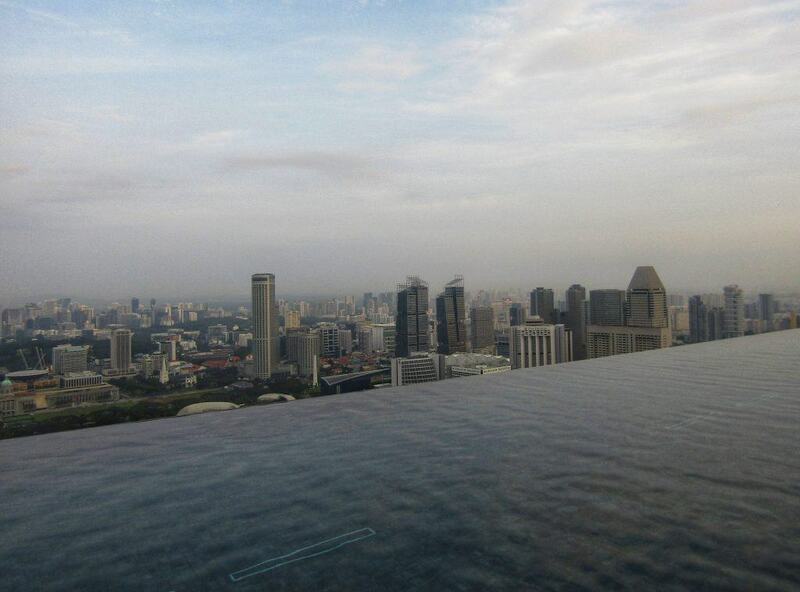 One of the main reasons to stay at the Marina Bay Sands is to access their ‘resident only’ pool deck. To be fair, we did spend a fair amount of time here as Bruno is such a water baby. Open between 6am and 11pm, the pool deck on the 57th floor is a great place to hang out when you have jet lag. On our second morning there, we watched sunrise from the hot tub which was simply amazing. Not only did we have the best views, but at 6am, very few people are up at that time and we had a tub to ourselves. If you happen to be awake early, or late for that matter, this is a great place to spend some time. The infinity pool is absolutely stunning but we found it a bit cold to spend much time in. I’m not sure if it is always so chilly but there was quite a bit of rain when we were there which might have cooled it down. Saying that, it was very popular and must be the most photographed swimming pool in the world. Sold on Singapore? Find flights with Singapore Airlines here! 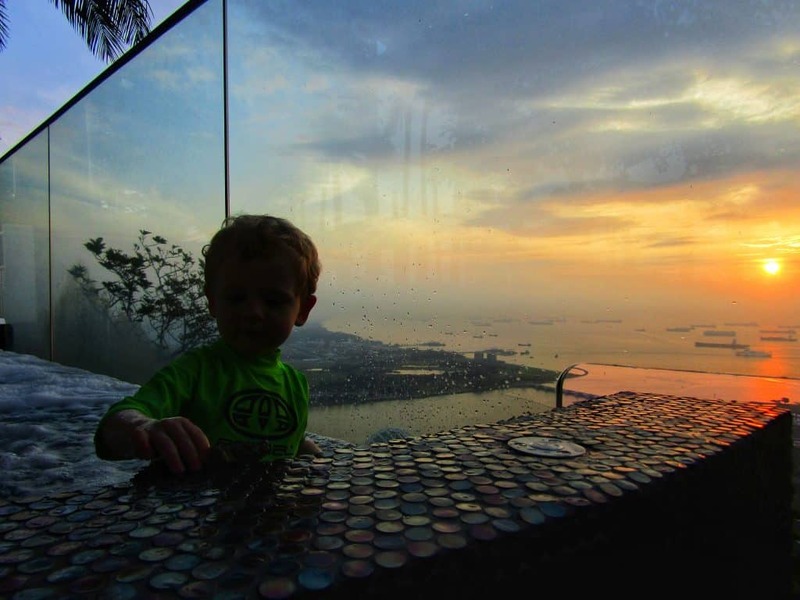 Have you found SINGAPORE WITH A TODDLER post useful? Leave a comment we love to hear from you. If we’ve helped you in some way, we would love if you could help us too. In this digital age there is a demand for immediate information online. Being a patron is a new-age way of giving a small token of appreciation for this information, which takes time to put together, with no financial return. We offer exclusive access to blog posts before they are published as a thank you. We also offer travel advice and consultancy at different payment tiers. You can sign up to our Patron program here. Disclaimer: This post Singapore with a toddler, has affiliate links. 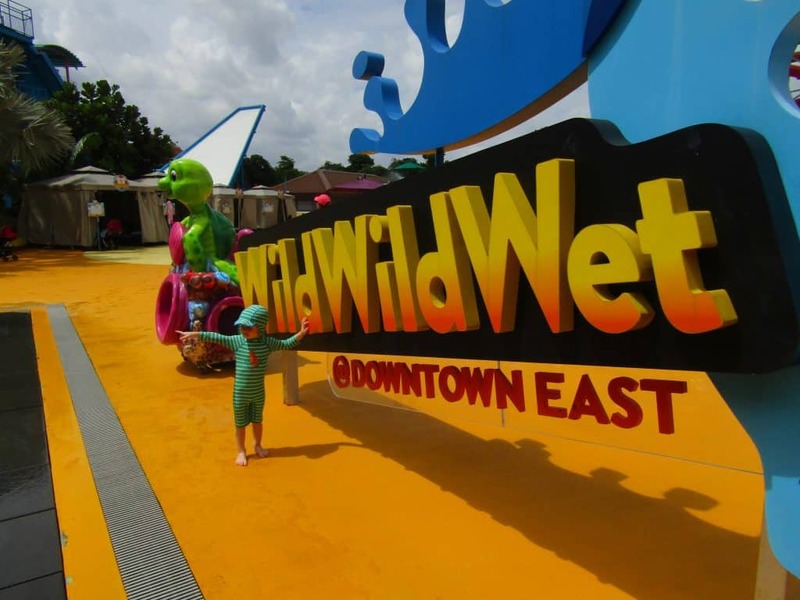 We enjoyed Wet Wet Wild and The Bird Southern Table complimentary in return for a written review. As always all views expressed our entirely my own. We are travelling there for 2 nights in the same hotel so it was very helpful. this is very helpful as we are planning our trip with our 1yo. Did you have to get any extra immunizations for your toddler? I would love to know the same!! 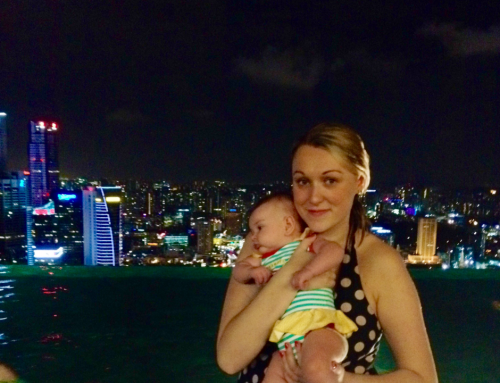 Singapore was a first overseas destination with our babe – 9 months old at the time and we thought it was great for kids! Some good suggestions here for things to do should we go back one day. We’re doing a 6hr layover in Singapore en route to Maldives in less than 8 weeks so good to hear about all the airport activities.